Please note all fields are required. You will need to confirm your review in an automatic e-mail sent to the account given so it must be a genuine one! 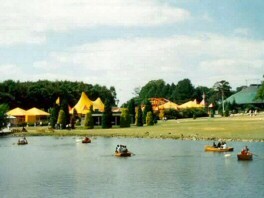 The rowing boats were the longest staying attraction in the park until their removal in 1996. The boats had their place on the lake in front of the house for at least 100 years, with many hundreds of people enjoying a relaxing time on the lake. With more thrilling rides becoming more popular, the boats' popularity dwindled, until they were removed in 1996.